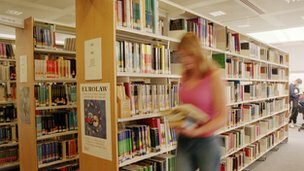 The government is to look at ways to transform libraries and make the borrowing of ebooks more commonplace. Culture Minister Ed Vaizey has asked publisher William Sieghart to lead a review of e-lending with a panel of experts. While there are some ebook libraries in the UK already lend books electronically, but many conventional libraries do not. There is little agreement about the best way to make ebooks available and also how to remunerate authors and publishers. “E-lending is currently in its infancy but growing fast. Just as e-readers are transforming the way people access books, e-lending could help transform the way people use libraries,” said Mr Vaizey. Mr Sieghart and the panel will consider a range of issues including: the benefits of e-lending; the current level of e-lending and future demand; the impact on libraries; and the effect on those who cannot keep up with changes in technology. One of the panellists is Janene Cox, president of the Society of Chief Librarians. She said that offering ebooks in libraries would help to generate new audiences. The panel is due to report back in the new year.